Modern style meets precision engineering in this GROHE Eurostyle basin mixer tap for low-pressure open water systems. 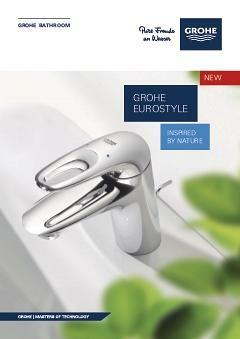 Easy and instinctive to use, it is perfect for family bathrooms and is packed with GROHE technology. Our SilkMove cartridges use state-of-the-art ceramic discs to create a rich and smooth lever action so you can effortlessly control the flow and temperature of water. Its EcoJoy technology reduces water consumption by up to 50% without reducing flow rate. The gleaming coating of scratch resistant StarLight chrome is easy to clean and has a sparkle that lasts for years. GROHE taps are designed not just to look great but also for maximum durability and outstanding performance, all backed up by German engineering excellence. As part of the Eurostyle range, this basin mixer beautifully complements the other products in the collection for a complete bathroom solution. Designed for easy installation with a single tap hole, this model is the perfect finishing touch!